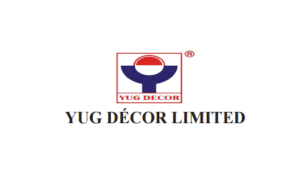 Yug Décor was incorporated as Yug Adhesive Private Limited under the provision of the Companies Act, 1956 vide certificate of incorporation dated June 23, 2003 issued by the Asstt. Registrar of Companies, Gujarat, Dadra & Nagar Haveli. Initially for a period of 3 years, the company was engaged in mere trading of Laminates and plywood. In the year 2006, the company had buy out manufacturing Unit (Unit I) of Water Based Adhesive and also commence the activity of and Rubber Solution/Adhesive i.e. PVA Based Adhesive, PVA Based Binder, Resin Solution and Rubber Adhesives for wood and footwear industry at Santej. In the year 2010, the company acquired the factory premises namely Manufacturing Unit II on lease basis situated at Plot No: 734/3, Opp. Nilkanth Hotel, Rakanpur, Tal: Kalol, Dist: Gandhinagar to segregate the manufacture of Rubber Solution/Adhesive activities from the Unit I. The company has also started export sales of PVA Based Adhesive to Ethiopia (INR 5.01 Lacs). During the year 2013-16, new products were added to the basket of manufacturing activity i.e. Lai (Starch Based Solution), Surface Coating: Melamyne and Magic Touch, Paints: Distemper, Cement Primer/Wall Primer, Emulsion, Enamel including Automotive Paints. After having strong foothold in the manufacturing of various water and solvent based chemicals/adhesives, in the year 2016, the company has acquired factory premises namely Manufacturing Unit III on lease basis situated at Plot No: 734/7, Opp. Nilkanth Hotel, Rakanpur, Tal: Kalol, Dist: Gandhinagar to undertake the manufacturing activities of paints and finishes. Yug Decor IPO allotment status is now available on Satellite Corporate Services' website. Click on this link to get allotment status.